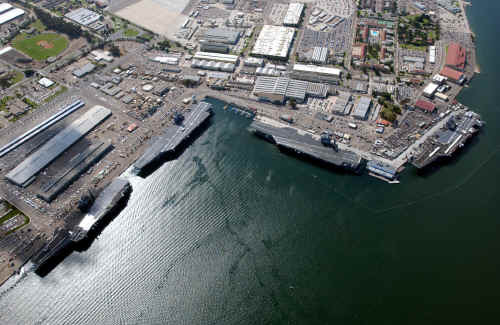 CD-89-99 (Navy, Coronado) Consistency Determination by Navy for developing home port facilities for two nuclear aircraft carriers, Naval Air Station, North Island, San Diego, Coronado, San Diego County. Quantifying the full impact of defense expenditures and the military's contributions to the region is nearly impossible. San Diego's history, social, and economic makeup are inextricably tied to the military's presence in the region. Adding the jobs supported by defense spending to the direct military and related civilian jobs existing in the San Diego region, about one-fourth of total employment locally is due to the military. The multiplier effect of the military base operations, defense contracts, payrolls, and other induced spending indicate defense expenditures account for up to one-fourth of the regions' total economic output. The military is clearly an integral part of San Diego's way of life and economic prosperity. The Navy bases in Navy Region, Southwest are: Naval Air Station, North Island; Naval Amphibious Base, Coronado; Imperial Beach; San Clemente Island; Fleet Anti-Submarine Base; Naval Station San Diego, Submarine Base, Old Town Campus; Broadway Complex in San Diego; Naval Air Station, Fallon, NV; Naval Air Station, Lemoore; Naval Weapons Station, Seal Beach, Naval Air Station Pt Mugu; CBC, Port Hueneme; Naval Medical Center, Balboa; and Naval Air Facility, El Centro. Near the former site of the old Fleet Landing, between Navy Pier and the G Street Mole, the Aircraft Carrier Memorial commemorates all the U.S. Navy's aircraft carriers and all who have served in them and flown from their decks. The memorial overlooks San Diego Bay, homeport to Pacific Fleet carriers since the earliest days of naval aviation. San Diego, California is a fast growing metropolis. Once dubbed "a Navy town," San Diego is now America's sixth largest city and home of diverse industries. The military brings in over $13 billion annually to the regional economy, second only to manufacturing. In California, environmental laws and regulations are the most stringent in the country. San Diego's elected officials have maintained good working relations with CNRSW but also are attentive to their other constituents. San Diego is an affluent city and it has become the home of high technology telecommunications and biotechnology companies. Rapid population growth, a diverse workforce from immigration, and a low unemployment rate make San Diego a challenging place to comply with environmental laws and regulations. The total revenues from defense spending in San Diego county directly accounted for 13% of the regional economy. The county continues to rank first in the nation for military and civilian dod wages and salaries. San Diego county is home to the largest number of military retirees anywhere in the nation, and the department of veteran affairs reports that more than 260,000 veterans reside in the county. The military makes further impacts on local educational institutions through the $15 million distributed to school districts under a US office of education program providing funds to districts based on the average daily attendance of the children of federal employees. Another impact on the region comes in the form of the many business trips to the San Diego region by military and DOD officials, base contractors, and reservists. It is estimated that $350 million annually is spent in San Diego for this purpose alone. The military's presence further creates numerous secondary jobs resulting from not only contracts with local private sector firms, but the dollars resulting from spending by military personnel and base expenditures. In general, for every two jobs supported directly by the military (active duty and civilian), the region employs another person. For every 36 jobs directly supported by the military, the gross regional product (GRP) rises by $1 million. For every $1 million increase in military expenditures for operations and construction, the region adds nearly 14 jobs and the GRP rises by $777,000. The Port of San Diego is located on San Diego Bay in southern California, about 96 nautical miles southeast of Los Angeles and just north of the United States - Mexico boundary line. The port area is under the jurisdiction of the San Diego Unified Port District and includes corporate area of the cities of Chula Vista, Coronado, Imperial Beach, National City, and San Diego. San Diego Harbor is both a commercial and military harbor. San Diego Bay entrance is 10 miles NW of the Mexican border. The Bay is 14 miles long and ranges from 55 feet deep at the entrance to a few feet deep at the extreme southern end at the head of the Bay. The Bay is considered one of the finest natural harbors in the world, and affords excellent protection in most weather. A low narrow sand spit, which expands to a width of 1.6 miles at Coronado North Island, on its northern end, separates the Bay from the Pacific Ocean at Coronado Roads. San Diego Bay encompasses 12,000 acres and is 14 miles long and, at half-tide, has an area of 18 square miles and a water volume of 300 million cubic yards. It lies entirely within the County of San Diego and is bounded by five cities: San Diego, National City, Chula Vista, Imperial Beach, and Coronado. Ecologically, San Diego Bay is considered one of the most important embayments of the California coast and has nationally and internationally significant natural resources. The Bay is a major stop on the Pacific Flyway and many species of birds, finfish, shellfish, turtles, bottom-dwelling invertebrates, and plants are dependent on the Bay. Over 50 endangered, threatened, or rare species are found in San Diego Bay. The Bay is also home to a large sportfishing and whale migration observation fleet. The Pt. Loma kelp bed, near the mouth of the Bay, is world famous as a diving, snorkeling, and surfing location. 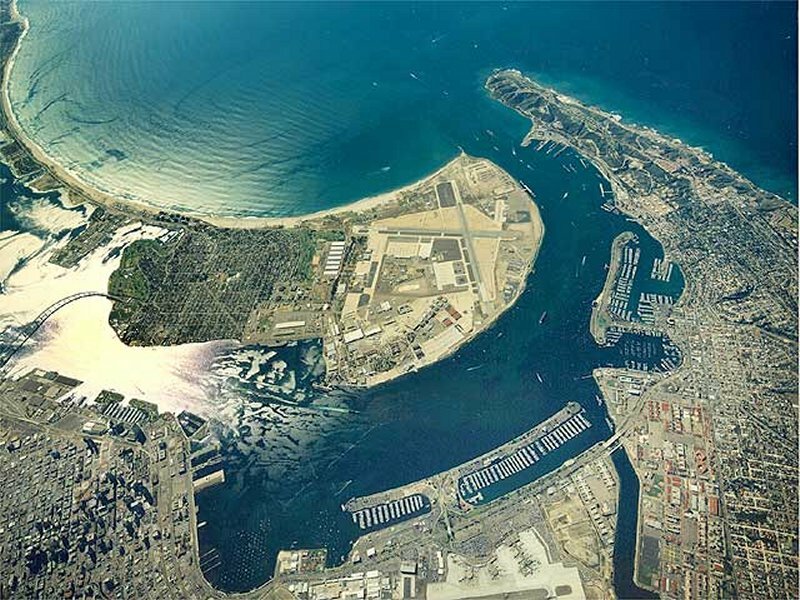 San Diego Bay's extensive shelter from ocean waves make it one of the finest natural harbors in the world. Three separate marine terminals provide facilities for a variety of commercial cargo handling and cruise ship operations. Principal cargo include lumber, newsprint, fertilizer, fresh, frozen, and canned foodstuffs, automobiles, palm oil, minerals, and fuel oil. Passenger cruise ships frequent the harbor on a daily basis. One third of the U.S. Naval Pacific Fleet is home ported in San Diego Bay, making it instrumental in the National Defense. 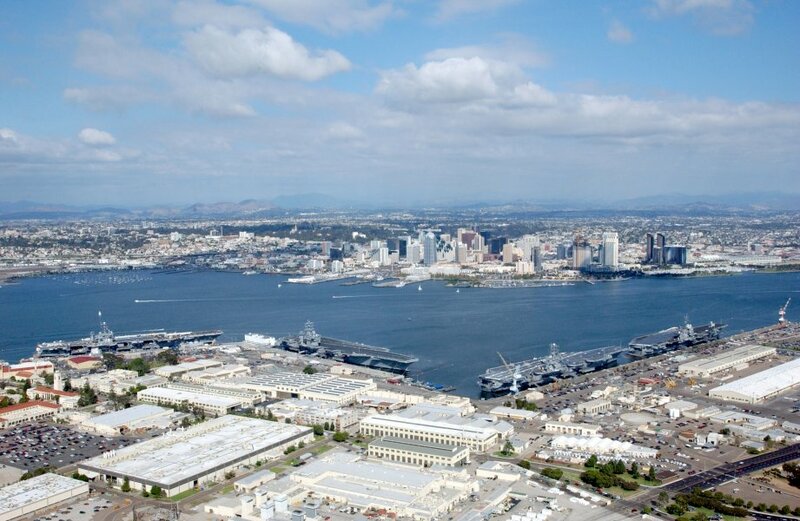 The Navy has designated San Diego Bay as a West Coast 'megaport'. The San Diego area is a major tourist and convention destination. The entrance and North Bay Channels, including the Carrier Turning Basin, is dredged to 42 feet. The Entrance Channel has been dredged to a width of 800 feet to mile 2.4 , narrowing to 600 feet at mile 3.0 and continuing at that width to the Carrier Turning Basin adjacent to the north side of Coronado on North Island. The Central Bay Channel to a depth of 40 feet between mile 7.1 and 8.84, and the South Bay Channel is authorized to a depth of 35 feet between miles 8.84 and 12.0. The Navy is deepening the outer and inner entrance channels to a depth of -55MLLW and -47 MLLW respectively. The Port of San Diego is situated as the first or last Port of Call along the western trade route including the ports of Los Angeles, Long Beach, San Francisco/Oakland, Portland, Seattle and Vancouver. There are a number of existing shipping operators who have indicated a need for a deeper navigation channel at the Port of San Diego. Anchorages for general use include all navigable waters of the harbor except: cable and pipeline areas, Special Anchorages, Naval Security Zones, Naval Restricted Areas, the U.S. Coast Guard Safety Zone, Unified Port District Regulated Areas, South San Diego Bay (southward of a line drawn between the mouth of Sweetwater Channel and a point on Silver Strand just northerly of Coronado Cays Crown Isle), and Designated Channels. Additionally, anchoring in Central San Diego Bay (lying northerly of South San Diego Bay and southerly of a line drawn westerly from the South Embarcadero Marina Park fishing pier to the easterly most point of North Island Naval Station in Latitude 32° 42'10"N) is prohibited except in Special Federal Anchorage A-5 and San Diego Unified Port District designated anchorages. Authorization to anchor in Central San Diego Bay outside designated anchorage areas for limited periods of not more than 72 hours may be obtained by application to the San Diego Unified Port District. Vessels anchoring in the portions of the harbor other than the areas excepted above, shall leave a free passage for other craft and shall not obstruct the approaches to wharves in the harbor. There is a single bridge spanning San Diego Bay. The San Diego/Coronado Bridge has 195 feet vertical clearance over the two middle channel openings with a horizontal clearance of 600 feet. The charts for the Bay show an in-bound lane between piers 18 and 19, and an out-bound lane between piers 19 and 20. It is accepted practice in San Diego Harbor to use the span between 19 and 20 for both directions of traffic, if the channel is clear. The San Diego shipping channel consists of a main channel with no branches or stems in its entire length to 24th Street Terminal. There are approximately 9,000 deep draft vessel transits of the Bay per year. There is one major choke point at Ballast Point near the entrance. This is the narrowest point in the channel and just inside is the U.S. Naval Submarine Base. It should be noted that submarines can be getting underway or maneuvering to berth at all hours of the day. In poor visibility conditions submarines can often paint on radar as a small contact due to their inherent construction characteristics of a small conning tower above water with approximately 90% of the remainder of the vessel submerged. Bayward of the U.S. Submarine Base, on the port hand, is the Naval Fuel Pier where contract tankers and, occasionally, naval combatants load and discharge fuel. To starboard in this same stretch is a naval ammunition pier on North Island. At the end of Shelter Island near the entrance range-markers is the outlet from the Shelter Island Yacht Harbor. A large measure of the small craft traffic will be found in this vicinity, particularly on weekends. At the other end of Shelter Island is the entrance to Commercial Basin where the majority of sportfishing and headboat traffic is berthed. After an eastward leg, the channel enters a turning basin area before heading toward the center spans of the San Diego/Coronado Bridge. Bordering on this turning basin are the Embarcadero with its Cruise Ship Terminal and adjacent to the Naval Supply pier. 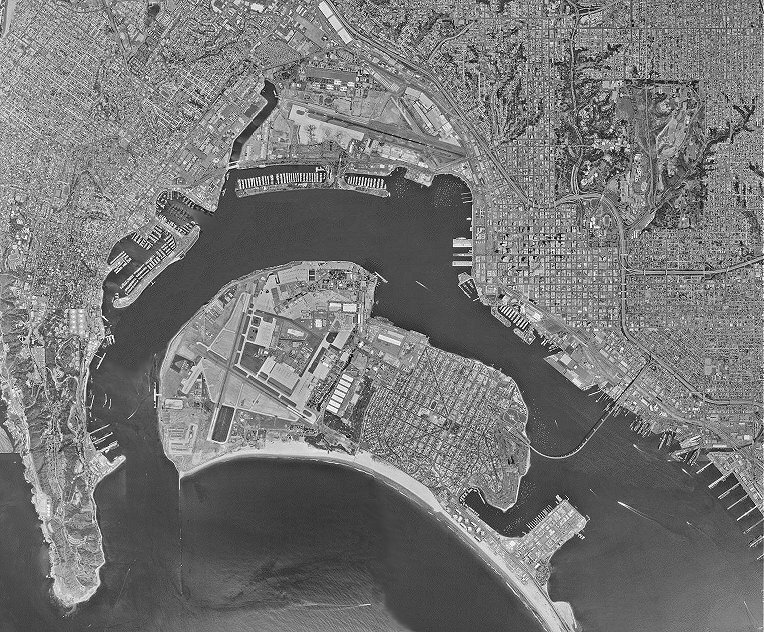 Across the channel and turning basin area are the Naval aircraft carrier berths on Naval Air Station, North Island The next channel leg toward the Coronado Bridge has the city's 10th Avenue Marine Terminal on the port hand. Between this section and on through the bridge, commercial shipyards give way to the U. S. Naval Station; all of these activities on the port hand. The channel then narrows, then proceeds to the 24 th Street Terminal. On average, there are two to three large commercial vessels (bulk freighters, break-bulk freighters, roll on/roll off (RO-RO) automobile carrier vessels, or cruise ships) in the port at any one time. RO-RO's call on the port's National City Marine Terminal at a frequency of three vessels per week. Various bulk and break-bulk freighters call at the port's Tenth Avenue Marine Terminal (TAMT), also at a frequency of three vesels per week. Barges transporting sand and aggregate materials operate on a daily basis between TAMT and the Port of Ensenada, Baja California. A number of locally-based work barges also transit the waterway in support of a variety of maritime-industrial business activities. Cruise ships make regular calls at the ort's B Street Pier Cruise Ship Terminal. In the fiscal year ending June 30, 2000, 99 cruise ships called at the Port, including a scheduled weekly liner. A commercial fishing fleet, consisting mainly of sportfishing vessels, operates out of the America's Cup Harbor Basin at Shelter Island and the port's commercial fishing berthing facility at the G Street Mole. Commercial sportfishing vessels are also plentiful and operate primarily from the America's Cup Harbor. The Port of San Diego's commercial vessel traffic has continued to grow as the Port continues to develop its marine terminal facilities. In fiscal year 1999/2000, the Port reported a 50% increase in shipping over its previous fiscal year and an all-time record annual tonnage of 2,435,902 metric tons of cargo handled through the Port. A total of 615 voyages by commercial vessels, representing 1230 transits in and out of San Diego Bay, occurred in fiscal year 1999/2000. 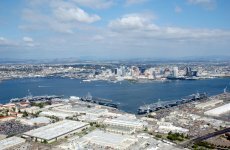 The Port of San Diego has completed a Maritime Master Plan and is undertaking several facility development projects that will provide facilities for future business with container lines. Military vessels make up the bulk of large vessel traffic in San Diego harbor and frequently transit the waterway enroute to berths at the 32nd Street Naval Station, the Naval Pier (south of Broadway Street pier), the North Island Naval Air Station, the submarine base at Ballast Point, and Amphibious Base Coronado in Glorietta Bay. Naval vessels of all classes, from 50' long amphibious landing craft to 1115' long aircraft carriers, can be found in the harbor. Landing craft and smaller vessel usually moor at the amphibious base in Glorietta Bay. Aircraft carriers moor at piers along the air station, while the bulk of the fleet moors at the 32nd Street Naval Station. U.S. Naval Service vessels moor downtown at the Naval Pier adjacent to the U.S. Naval Supply Center. There are three Coast Guard 110' patrol boats and two 178' patrol vessels stationed at Point Loma. The Coast Guard station northeast of Harbor Island has two 41' utility boats. Various classes of cutters frequent San Diego for training purposes and usually moor at the Naval Pier downtown or at the 32nd Street Naval Station. The U.S. Navy houses their Afloat Training Group at the 32nd Street Naval Station. ATG trains and tests all U.S. Military ships larger than 110' feet in length. These tests are administered through a program called Tailored Ship Training Availability. TSTA is conducted while the vessel is underway, at anchor and moored. The testing vessels normally anchor south of Harbor Island. Underway drills are conducted outside of San Diego Bay. Drills and training that can be conducted pier-side are conducted at either the 32nd Street Naval Station or at North Island Naval Air Station. In its 2005 BRAC Recommendations, DoD recommended to close Naval Support Activity New Orleans, LA. As a result, it recommended to As a result, it recommended to consolidate the Navy Reserve Command's installation management function with Navy Region Southwest at Naval Station San Diego, CA and two other installations. The consolidation of the Navy Reserve Command installation management functions with other Navy Regional organizations would be part of the Department of the Navy efforts to streamline regional management structure and to institute consistent business practices.